Plan de la Ville de Candie. [Iráklion] - BELLIN, J.N. 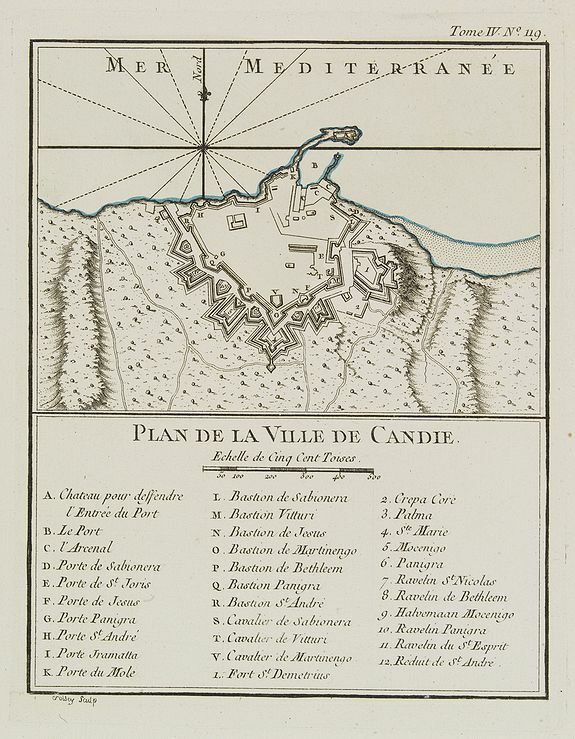 Title : Plan de la Ville de Candie. [Iráklion]. Map maker : BELLIN, J.N.. Size : 8.6 x 6.8 inches. / 21.8 x 17.3 cm. Description :This chart shows the harbour of Iráklion. In lower part a key A-V, 1-12 to the bastions and gates of the town. From Bellin's Petit atlas maritime.Tome IV N119. Jacques Nicolas Bellin (1703-1772) was one of the most important and proficient French cartographers of the mid-eighteenth century. He was appointed the first Ingenieur Hydrographe de la Marine, and also Official Hydrographer to the French King. Bellin also produced a substantial number of important separately issued maps, particularly reflecting continuing discoveries and political events. His maps and charts were finely engraved and produced, and set a high standard of accuracy. Condition : In very good condition. Good margins, printed on heavy paper.